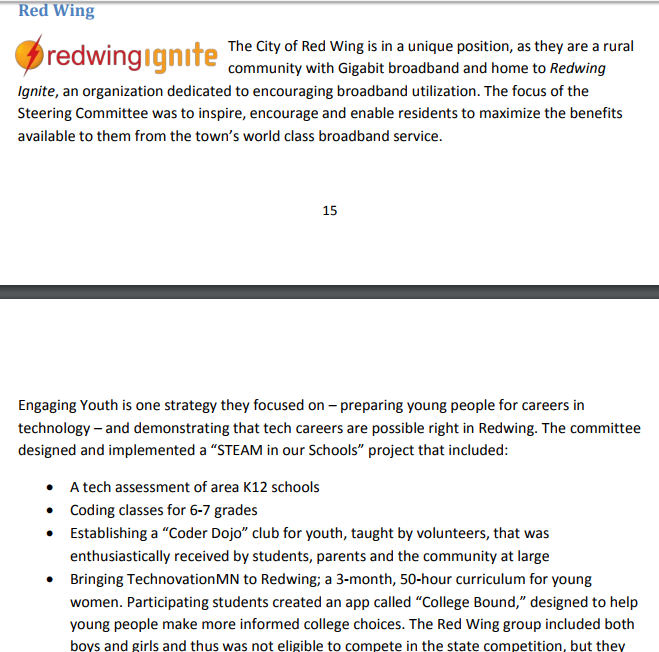 The City of Red Wing is in a unique position, as they are a rural community with Gigabit broadband and home to Redwing Ignite, an organization dedicated to encouraging broadband utilization. The focus of the Steering Committee was to inspire, encourage and enable residents to maximize the benefits available to them from the town’s world class broadband service. Bringing TechnovationMN to Redwing; a 3-month, 50-hour curriculum for young women. Participating students created an app called “College Bound,” designed to help young people make more informed college choices. The Red Wing group included both boys and girls and thus was not eligible to compete in the state competition, but they did earn an honorable mention at the Ignite Cup. Piloting in the United States a program developed in Europe called “Apps for Good.” “Apps for Good” seeks to “equip students to research, design and make digital products and take them to market.” It was a huge success, and the community has found a way to continue the program beyond the grant period. The establishment of three “tech internships” was another very successful youth-oriented initiative undertaken by the Blandin Broadband Community Steering Committee. They recruited college students to come to Redwing to help three enterprises – a local business, a non-profit and the county government – make better use of technology. The students all said they learned a lot; they were given challenging opportunities to really make a difference. The intern hosts all want more interns! One of the interns created a new e-commerce website for a local business, boosting sales significantly. Another helped prepare a local business for a large CRM migration, and a third worked with the county to create a web application to manage the county’s fleet of cars. Now employees can use the app to check out cars, track mileage, and a whole host of other features. The County fleet manager reported it has solved many headaches for all county workers who need to use county vehicles. For a more recent look at Red Wing – check out the Goodhue County profile I did earlier this year.